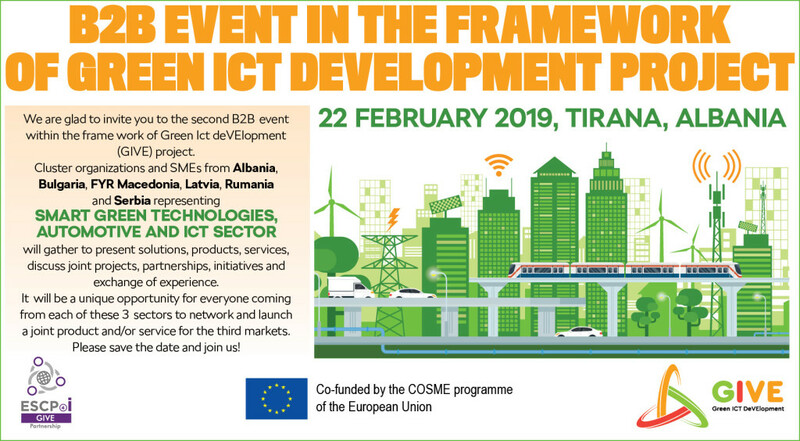 We are glad to invite you to the second B2B event within the frame work of Green Ict deVElopment (GIVE) project. Cluster organizations and SMEs from Albania, Bulgaria, FYR Macedonia, Latvia, Rumania and Serbia representing smart green technologies, automotive and ICT sector will gather to present solutions, products, services, discuss joint projects, partnerships, initiatives and exchange of experience. It will be a unique opportunity for everyone coming from each of these 3 sectors to network and launch a joint product and / or service for the third markets. Please save the date and join us!